This is a scarce 1943 Japanese map of the Malay Peninsula (Malaysia) including Singapore and Sumatra, Indonesia, from the Great East Asia Atlas issued during World War II. The map covers the Malay Peninsula including Singapore as well as the island of Sumatra, Indonesia. 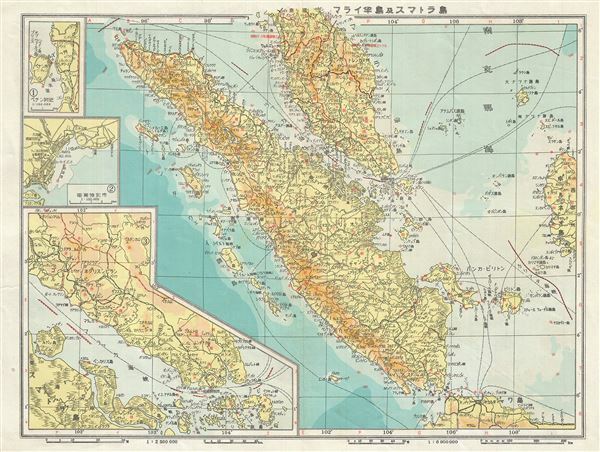 This map was issued in 1943, after the capture of Malay and Sumatra by the Japanese Army. It offers superb detail regarding both topographical and political elements. Notes cities, railways, rivers, shipping lines, etc., and uses shading to display oceanic depths. Includes three insets along the left border. All text is in Japanese.